Ocean and Coastal Management just published the Rural Coastal Community Resilience Framework in their special edition on coastal systems in transition. The article features the framework that was developed using interviews and then tested with focus groups on the Albemarle Pamlico Peninsula in Columbia, Swanquarter, and Little Washington. The research found that after sharing climate change science on coastal hazards like sea level rise, saltwater intrusion, and flooding, a conversation about livelihoods, prosperity, sustainable development, community, and personal agency within coastal communities can help boost stakeholders perceived ability to adapt! It helps to talk through those community strengths and brainstorm potential actions for adaptation! Thanks again to all the participants for being part of the research project. ​On October 2nd, we held a workshop for professionals that are in some way involved with land and water management decisions in our study region, the Albemarle-Pamlico Peninsula of North Carolina (APP). Workshop attendees represented employees of federal agencies, state government agencies, and non-profit organizations, as well as other university researchers working in the region. In addition to sharing our results and findings, we wanted to get a better idea of how our workshop attendees viewed issues of saltwater intrusion. Most of these folks have been tackling these issues for much longer than us, so we were excited to gain some valuable perspective. ​At the beginning of the workshop, we polled our audience on a few questions that we had previously asked residents, landowners (>5 acres), and members of the forest industry in the region in some of our teams’ research efforts. After we held a poster session (add link to posters) to interactively discuss the results of our study with attendees, we also polled them to see if they thought residents, large landowners, and members of the forest industry professionals perceive risks to saltwater intrusion. In this blog post, we present the results that we shared with the workshop attendees during the last hour of our workshop. ​​We asked our workshop participants if they believed that APP residents, large landowners, and forest industry professionals perceived a risk to saltwater intrusion. The majority of workshops attendees believed that all three groups did indeed perceive a threat from saltwater intrusion, particularly large landowners. However, it is interesting that roughly 20% of attendees did not think that APP residents perceive a threat from saltwater intrusion. ​Almost all of our workshop participants agreed that the APP was currently at risk of saltwater intrusion. 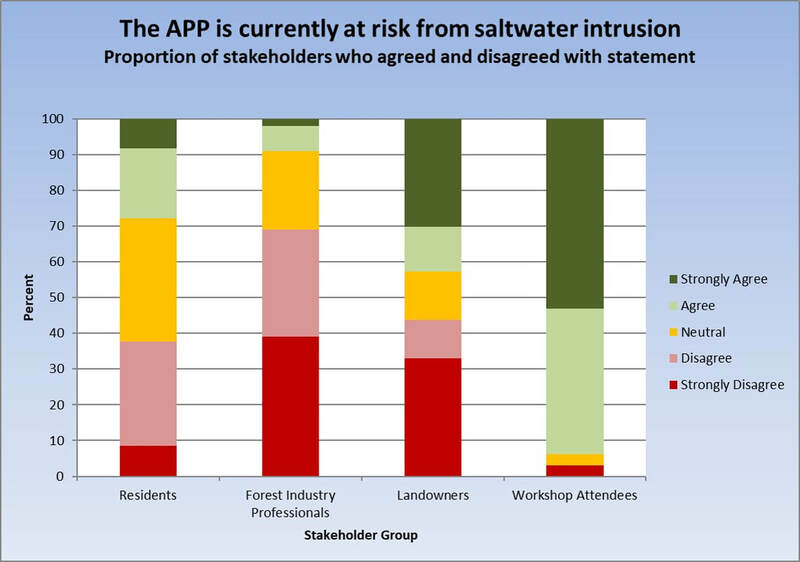 However, few residents (28% of our study population) agreed that the APP is currently at risk from saltwater intrusion. Interestingly, even fewer forest industry professionals (9%) agreed with the statement and many of them (69%) disagreed with the statement. Large landowners on the peninsula agreed a bit more (33%), but even still, the same proportion of this group of stakeholders “strongly” disagreed with the statement (33%). What Might These Differences in Risk Perceptions Mean? ​The workshop has highlighted a gap between the risk perceptions of federal, state and non-governmental natural resource managers working in the region and the people who reside on the Albemarle Pamlico Peninsula. Additionally, the workshop discussions highlighted that the natural resource managers were surprised by, and did not anticipate, such differences in risk perceptions among the other stakeholder groups (residents, large landowners, and forest industry professionals). These differences in risk perceptions illustrate the potential benefits of increased communication and engagement between management agencies and the broader public. It will become increasingly important to raise awareness about these emerging issues if residents and industries are to adapt to this rapidly changing environment. Residents and landowners are likely to see changes on their properties as sea level continues to rise and the reach of saltwater increases landward. Our next SALT team workshop on the APP focuses on these local stakeholders to share the findings of the research project and help begin the discussion on saltwater intrusion and the risks being faced across the peninsula. 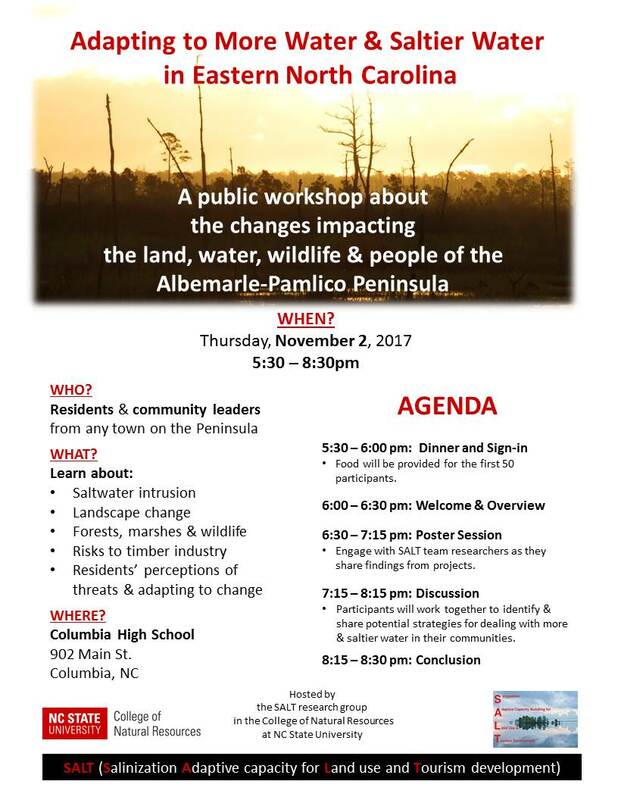 We're gearing up for a series of workshops aimed at bringing together various people involved with and affected by salinization on the Albemarle-Pamlico Peninsula. The first is on October 2nd and will focus on land management decisions to address salinization issues. Stay tuned for more info and let us know if you're interested in attending! Orrin and Keith Pilkey wrote this timely article about the political situation of sea level rise and coastal management and development. Though the article focuses on the barrier islands, our research is beginning to suggest substantial environmental changes for a much larger extent of low-lying coastal areas, and at much shorter time scales. On day 2 following ignition, the Whipping Creek Fire spread from 600 to over 9,500 acres, fueled by high winds and dry marsh grasses. ​On Monday, April 18, a wildfire started on private land and quickly spread to the adjacent Alligator River National Wildlife Refuge and Dare County Bombing Range. 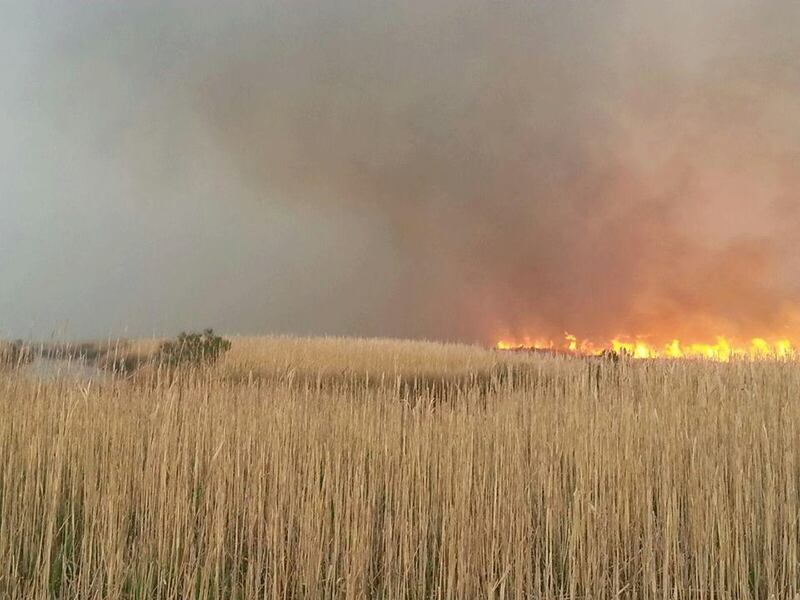 High winds and dry marsh grasses fueled the blaze and allowed it to roughly double in size daily since it ignited. Fortunately, because this area is mostly undeveloped, no human communities are in immediate danger. In addition, fire historically has played an important role in shaping the natural environment of these areas, acting as a restorative force for the ecosystems affected. Many plant species associated with disturbance will respond immediately following the fire, whereas these same species were outcompeted by other plants in the absence of disturbance. Similarly, many wildlife species of conservation concern have been shown to respond favorably to the early successional stages following disturbance. However, as sea levels continues to rise, the interaction between fire and saltwater intrusion remains poorly understood. Previous research suggests that rather than proceeding through the usual post-disturbance stages of recovery and ultimately returning to resemble pre-fire conditions, acute saltwater intrusion in advance of sea level rise may result in more permanent changes to the vegetation community. Specifically, low concentrations of salt before the fire may not have been enough to cause mortality of mature trees, but those low concentrations may be enough to prohibit regeneration of seedlings following the fire. Instead of recovering back to the mature forest it once was, a forest may be permanently converted to a marsh, dominated by more salt-tolerant herbaceous plants. We are anxious to see how the plant and animal communities respond following the Whipping Creek Fire, as well as compare these changes to our continued monitoring of areas that burned previously. Ultimately, we hope to better understand how these two ecological drivers interact and what that means for areas projected to be vulnerable to saltwater intrusion in the future. 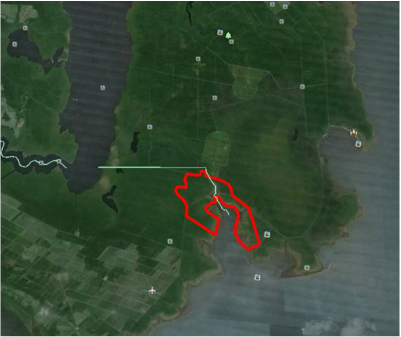 The Whipping Creek Fire perimeter as of April 20th, 2016. 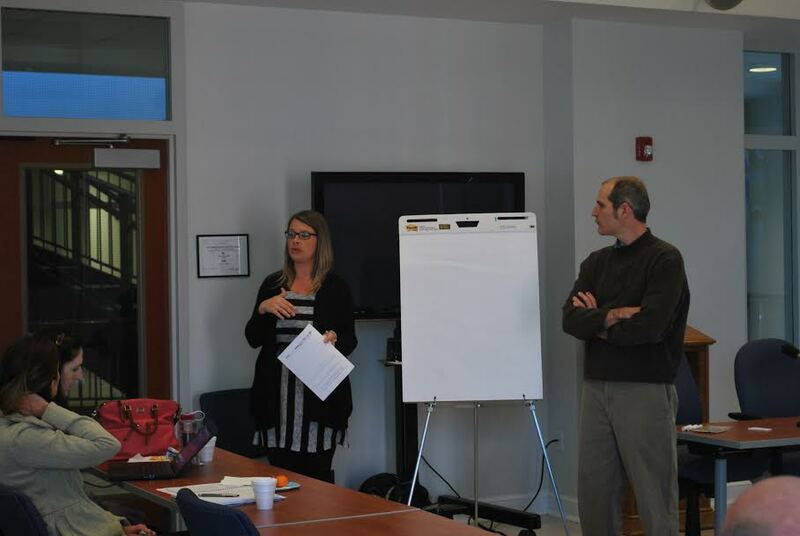 To follow up with the Vulnerability, Consequences, and Adaptation Planning Scenarios workshop (VCAPS) conducted in Hyde County in 2013, Dr. Jessica Whitehead of NC Sea Grant returned to hold a town hall meeting on Hyde County flood resiliency planning. It was held at the Hyde County Government Center in Swan Quarter on the 3rd of March. After a welcome by Kris Cahoon Noble, Director of the Hyde County Office of Planning and Economic Development, and an introduction by Jessica, Dr. Jason Evans of Stetson University shared his research on flood mitigation options and the next steps for the county. The analysis included the amount of structures within in various flood plains i.e. 10, 30, 100, and 500 years, and how their value compares to possible damage under these events. From there the floor opened for public input and feedback on the research and planning. There was lively discussion on changes to flooding patterns in recent decades within the county, including current ongoing nuisance flooding problems from the wet fall and winter, before the focus turned to informing the Community Rating System (CRS). The CRS is an incentive program where local governments complete various activities to get points, and points are used to assign the government a class rating; for each class rating the County earns, National Flood Insurance Program policyholders get an additional annual discount on flood insurance. It will be crucial for saving money here within the county. The Nature Conservancy then shared an app in development being piloted in Dare and Hyde Counties that can be used to document qualifying undeveloped open space acreage, which leads to increased numbers of CRS points Hyde County may earn. After this meeting, work will now focus on continuing to develop content for the Hyde County Resident’s Flood Preparation Guide. Sea Grant will also look to gather more feedback from locals before the flood resiliency project reaches its closeout in June of this year. Kris Cahoon Noble and Dr. Jason Evans present in front of the crowd at the Town Hall meeting on Resilience in Swan Quarter. 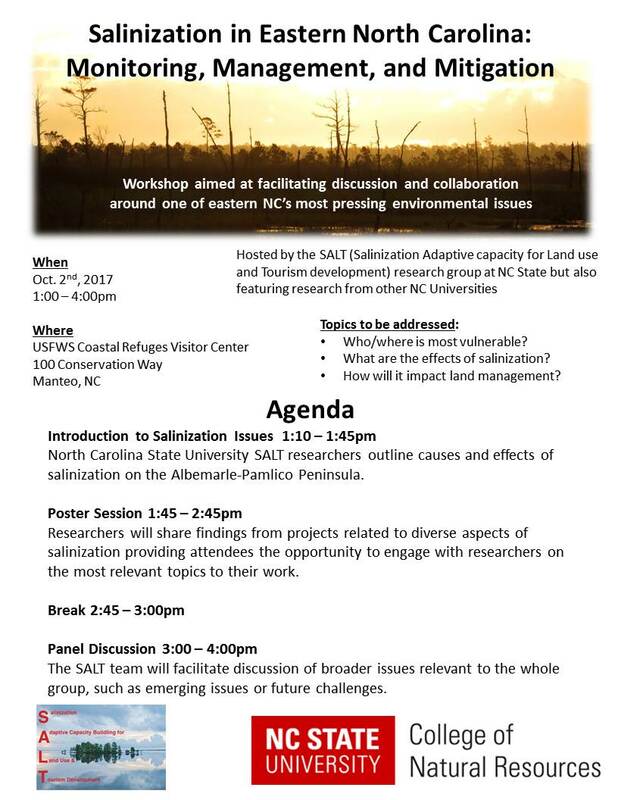 With help from Priscilla Morris and Dr. Erin Seekamp of the SALT research team and Jessica Whitehead of North Carolina Sea Grant, Matthew Jurjonas facilitated a focus group in Columbia, North Carolina. The conversation revolved around the local economy with concepts like risk and resilience in rural coastal communities. First, the participants were presented with the local context of climate change impacts including saltwater intrusion, a sea-level rise projection, and flood maps. From there the group went through a guided series of dynamics where participants voted on indicators that represented either risk or resilience to these climatic impacts within their community. The goal was to capture the local perspective on preparedness and needs to begin the climate adaptation dialogue. Considering factors like tax base, tourism, and economic opportunity will be crucial for planning and funding flood mitigation strategies like dikes, flood water pumping, and protecting critical infrastructure like water treatment facilities, power stations, and highway systems that are used for emergency evacuation. Given that context participants weighed in on the diversity of local livelihoods versus the dependence on specific industries like agriculture, fishing, and logging to drive the local economy. Predicting how successful these business sectors will be as the environment transitions to saltier conditions will influence the related resource dependent livelihoods. 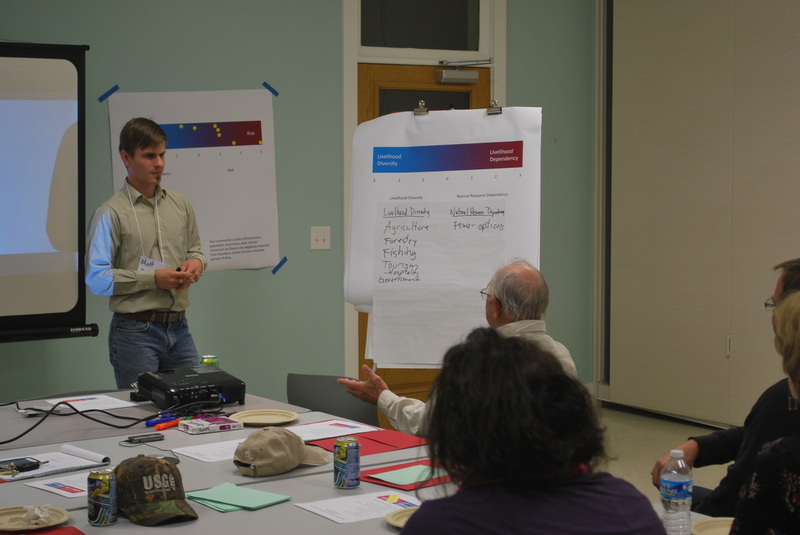 Matthew Jurjonas engages local stakeholders on risk and resilience in rural coastal communities during a focus group in Columbia, NC.